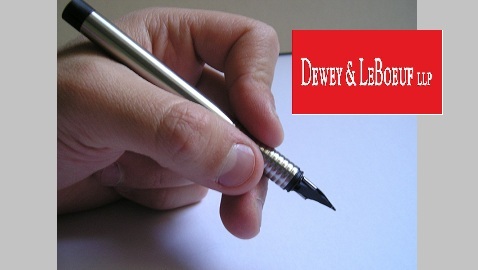 On Thursday, former partners of Dewey agreed to pay at least $ 50 million for a settlement agreement. The amount is the minimum that had been sought by the firm in order to submit the settlement proposal to the bankruptcy court. If approved, the settlement would be the first major recovery for the creditors of Dewey & LeBoeuf. According to court filings, the law firm owes at least $ 315 million to creditors. The settlement proposal had been revised and delayed several times. Under the final offer, former partners needed to contribute a minimum of $ 50 million by 5 pm on August 16. The condition was met by 2:45 pm according to an email sent to former partners of Dewey. The email did not contain details about the amount of money raised so far. According to a source of Reuters, at least 300 partners out of 672 agreed to the offer. Under the guidance of restructuring officer Joff Mitchell, the Dewey estate had been building pressure upon former partners to settle disputes with the firm and return a part of their compensation to pay creditors. However, many former partners disputed the settlement offer as containing unfair terms. Previous offers for settlement had been rejected by the former partners as being inequitable to a major extent towards lower-earning partners. Friedman objected to the composition of the wind-down team of Dewey, and said the team was managed by lawyers who were biased towards previous high earners at the law firm because the same groups had advised the firm before its collapse. It is possible that the Dewey estate will try to collect an additional estimated $60 million from former partners over “unfinished business” claims. Under such claims, the trustee is seeking to recover profits on legal business that the former partners took away from the law firm. Former partners of the law firm who did not sign the deal may either have to accept the deal with a 25% penalty or maybe vulnerable to clawback litigation.